It's hard to know exactly how many headlines around the country and the world State Sen. Carl Kruger's proposal to ban walking while listening to an iPod or talking on a cell phone has generated. The thumbnail of the story is that the Senator wants to impose a $100 fine for the offense. His proposal has drawn everything from support to outrage to knee slapping laughter. (Sen. Kruger's district includes Brighton Beach, Manhattan Beach, Mill Basin, Bergen Beach and other neighborhoods in Southern Brooklyn.) The story has spread far and wide. 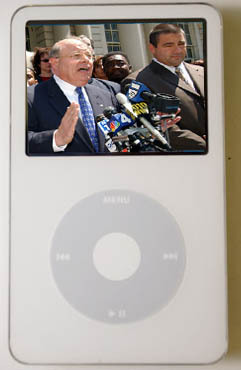 The headline China Daily put on the Reuters story was "New York May Ban iPods While Crossing Street." Daily India.com headlined the story, "Lawmaker Wants to Outlaw Street Grooves." As of 7:30AM this morning, searching for "Carl Kruger" on Google News produced more than 400 stories. Searching for "iPod ban" produces slightly more. Most of the stories have mocking headlines like "State Senator Aims to Ban 'Walking While Talking'" and "Warning: Be on the Lookout for Killer iPods." There are also more than a few references to walking and chewing gum at the same time. Some ideas simply seem to get more attention than others.